Grow food for those living on site. Create and provide heat, electricity, water. Build houses using sustainable/green / economical methods as much as possible. Options to work as a team and enjoy the experience. -'rocket stoves' (super efficient wood stoves). Electricity: is gathered by solar panels. Depending upon how many people, and the personal goals of each, we could be taking care of animals / garden / building each house together - although not a requirement. 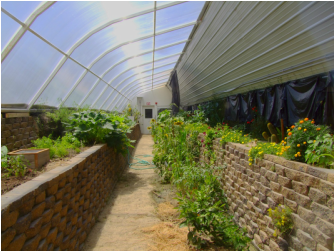 Earthships: Grow food, clean and recycle water, heated only by the sun and heat stored in the earth. All these factors result in basically free food and utilities. Recycling and purifying water is built in as well.